Institute for Computing Information and Cognitive Systems / Computer Science (ICICS/CS) is located near the red arrow on the map below. You can plot a second location below. 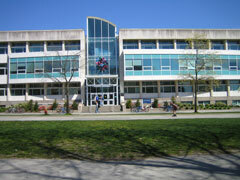 Finding Your Way: The Institute for Computing Information and Cognitive Systems / Computer Science building is located on the east side of main mall, north of the Forest Sciences Centre. Detailed Directions: A road map and detailed directions for Institute for Computing Information and Cognitive Systems / Computer Science (ICICS/CS) can be found on Google. Use the search function below to find and highlight a second location with an orange arrow on the map above (the red arrow will indicate the first location, Institute for Computing Information and Cognitive Systems / Computer Science (ICICS/CS)).